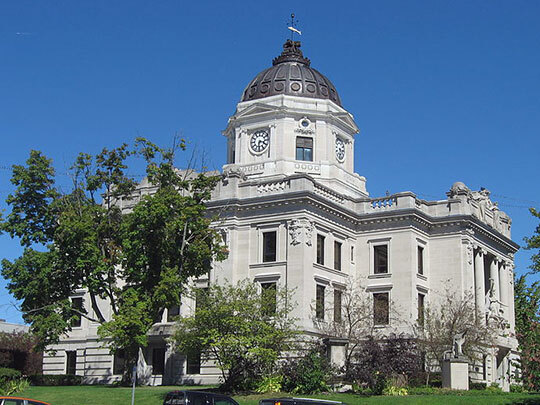 Photo: Monroe County Courthouse, Courthouse Square, Bloomington, IN. Listed on the National Register of Historic Places in 1976. Photographed by User:Nyttend (own work), 2010, [cc0-by-1.0 (creativecommons.org/publicdomain/zero/1.0/deed.en], via Wikimedia Commons, accessed July, 2013. The Monroe County Court administrative offices are located at 301 North College Avenue, Bloomington, IN 47404; phone: 812-349-2614. The territory that would become Monroe County was on the boundary between the land of the Delawares and that of the Piankeshaws and Pecankeeshaws, so that it was the home and hunting ground of these three tribes as well as of the Miamis. The territory was not obtained from the Indians wholly at one time from various treaties, and the county was organized before the last treaty was signed. In the southern portion, William Harris and Arthur Henrie surveyed the county lands in the autumn of 1812. In the north a survey was done by Thomas Brown and J. Hedges in 1819. The legislature approved the county in 1818. A courthouse was established at the home of Adam Blair, and Bloomington was laid out to serve as the county seat, and a log courthouse was quickly built there. The first meeting of the Commissioners of Monroe County was held in April, 1818. The Commissioners were Bartlett Woodward, Michael Buskirk and James Parks. Charles Blanchard, editor, Counties of Morgan, Monroe and Brown, Indiana, F. A. Battey & Company, Publishers, 1884, Chicago.